Psychic's Thyme has been serving the Pagan and New Age community in the Rochester area for over a decade. They offer a wide range of products, including herbs, essential oils, crystals and gemstones, tarot cards, runes, jewelry, and a selection of books on a variety of subjects. The shop's staff offers many services, including astrological charts, tarot readings, mediumship readings, palm readings, crystal healing, and energy healing work as well as various books. Note that due to staff scheduling, not all services are available on a given day. Those interested in a particular service should call the store and make an appointment. In addition to providing merchandise and the above services, Psychic's Thyme also serves as a learning center. Courses on various subjects are offered throughout the year after regular store hours. To find out more information, please check the store's calendar or stop in and pick up a copy of this year's course catalog. Psychics Thyme was previously located at 439 Monroe Avenue. They opened their current CityGate Plaza location in Lyell-Otis in February 2013. 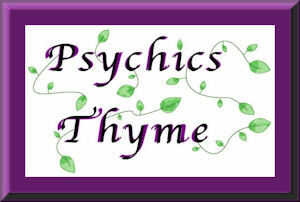 Psychics Thyme was voted "Best Local Psychic/Medium" in City Newspaper's "Best of Rochester" awards in 2010.